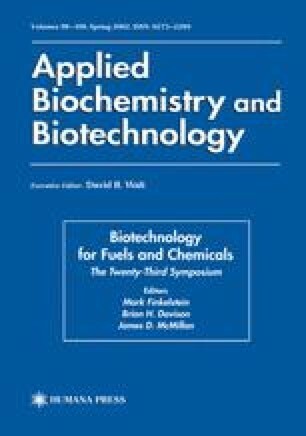 Two-step steam pretreatment of softwood was investigated with the aim of improving the enzymatic digestibility for ethanol production. In the first step, softwood was impregnated with SO2 and steam pretreated at different severities. The first step was performed at low severity to hydrolyze the hemicellulose and release the sugars into the solution. The combination of time and temperature that yielded the highest amount of hemicellulosic sugars in the solution was determined. In the second step, the washed solid material from the optimized first step was impregnated once more with SO2 and steam pretreated under more severe conditions to enhance the enzymatic digestibility. The investigated temperature range was between 180 and 220°C, and the residence times were 2, 5 and 10 min. The effectiveness of pretreatment was assessed by both enzymatic hydrolysis of the solids and simultaneous saccharification and fermentation (SSF) of the whole slurry after the second pretreatment step, in the presence of antibiotics. For each pretreatment combination, the liquid fraction was fermented to determine any inhibiting effects. At low severity in the second pretreatment step, a high conversion of cellulose was obtained in the enzymatic hydrolysis step, and at a high severity a high conversion of cellulose was obtained in the second pretreatment step. This resulted in an overall yield of sugars that was nearly constant over a wide range of severity. Compared with the one-step steam pretreatment, the two-step steam pretreatment resulted in a higher yield of sugar and in a slightly higher yield of ethanol. The overall sugar yield, when assessed by enzymatic hydrolysis, reached 80%. In the SSF configuration, an overall ethanol yield of 69% was attained.